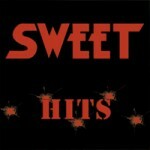 Share the post "Album review: SWEET – Hits"
This is a thirteen song compilation with a difference from the multitude of Sweet collections out there in that all the songs have been re-recorded by the current line up, namely sole original member guitarist Andy Scott joined by drummer Bruce Bisland (Gary Barden’s Statetrooper), lead vocalist/bassist Pete Lincoln and guitarist/keys player Tony O’Hara (ex-Praying Mantis). A version of this album has been available on their tours and online with ‘Little Willy’ and ‘Wig Wam Bam’ done as a medley (both are separate full songs on here) and ‘New York Groove’ which doesn’t make this version. The track listing covers from their early bubblegum hits (with a medley of ‘Co Co’, ‘Funny Funny’ and ‘Poppa Joe’) through to the band’s last hit single ‘Love Is Like Oxygen’. The only odd song is the cover of ‘Peppermint Twist’ (played in the style of Status Quo!) which was a big hit for the Sweet in Australia. I am a big fan of the band since seeing them perform ‘Blockbuster’ on ‘Top Of The Pops’ (although it was some years later before I actually bought any of their music), so this album is a delight from start to finish. Pete Lincoln sounds a lot like the late Brian Connolly and the band have stayed faithful to the original arrangements by and large – for example you can hear the band roll call at the start of ‘Ballroom Blitz’ changed to ‘Bruce’ instead of ‘Mick’. This entry was posted in ALBUM REVIEWS, ALBUM REVIEWS (Mobile), All Posts and tagged 70's rock, Andy Scott, Bruce Bisland, glam, glam rock, hard rock, Hits, Pete Lincoln, review, Sweet, Tony O'Hara. Bookmark the permalink.